U.S. House Speaker Paul Ryan is coming to Texas to raise money as he concentrates his attention on protecting the House Republican majority with Donald Trump at the top of the ticket. U.S. House Speaker Paul Ryan is coming to Texas to raise money as concentrates on protecting the House Republican majority, but might face resistance from some Texas Republicans loyal to presidential nominee Donald Trump. The Wisconsin Republican will headline a fundraiser Oct. 18 in Houston, according to an invitation obtained by The Texas Tribune. The event is for Team Ryan, the joint fundraising committee that benefits GOP members running for re-election, and tickets range from $10,000 to $100,000. Word of the fundraiser comes at a politically difficult time for Ryan, who has grappled with his support for his party's controversial presidential nominee — especially after the release Friday of a 2005 clip showing Trump speaking lewdly about women. On a conference call Monday with Republican lawmakers, Ryan reportedly stopped short of withdrawing his endorsement of Trump, but said he will focus his political efforts on keeping the House under GOP control in November. That has upset some major pro-Trump donors in Texas, where the nominee is set to hold fundraisers Tuesday in San Antonio and Dallas. Some longtime Texas fundraisers said Monday they would not help Ryan as long as he maintains his current posture toward Trump, which they view as Ryan not backing his party's standard bearer. "I just think it’s really a shame for any Republican officeholder not to be supporting the nominee," said top Trump fundraiser Roy Bailey, citing the U.S. Supreme Court as the main reason Republicans should unite behind Trump. "I will not be supporting Speaker Ryan’s fundraiser or any other Republican that’s not behind the nominee." "I personally will withhold contributions and withhold my assistance for anyone who will not support our nominee,” added Mica Mosbacher, a former finance co-chair of the Republican National Committee who is aiding Trump's efforts in Texas. "I feel congressmen need to be a voice for the people and they need to keep country first." Nine members of Texas' congressional delegation are listed as hosts of the Team Ryan fundraiser: U.S. Reps. Brian Babin of Woodville, Kevin Brady of The Woodlands, John Culberson of Houston, Blake Farenthold of Corpus Christi, Bill Flores of Bryan, Michael McCaul of Austin, Pete Olson of Sugar Land, Ted Poe of Humble and Randy Weber of Friendswood. The hosts also include oil executive Jim Flores and his wife Cherie. 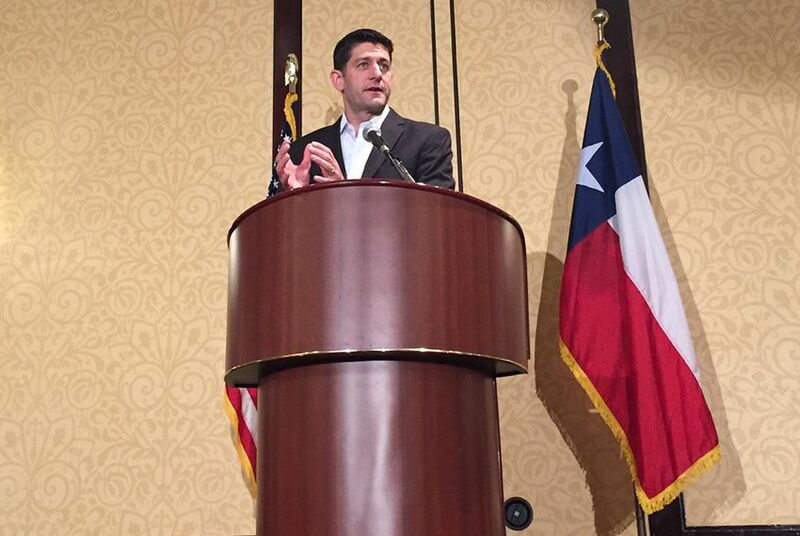 The Oct. 18 fundraiser is expected to be part of Ryan's Texas trip to campaign for U.S. Rep. Will Hurd in San Antonio. The Republican freshman is fighting for re-election against Democrat Pete Gallego in the only competitive congressional race this November in Texas.